Anne Churchill is known locally in Columbia, Missouri as the go-to event and wedding planner and expert. She has a passion for planning flawless events and creating one of a kind event designs. Anne started her business in 2010 and now holds eight years of event planning experience and a Bachelors Degree from Columbia College. As the Owner & Event Planner of AnnaBelle Events & Rentals, she leads a team of professional and experienced Event Assistants. AnnaBelle Events & Rentals is located in the North Village Art District of downtown Columbia, in Studio 107. The company focuses on planning corporate events, social occasions and weddings throughout Missouri. The company’s work continues to be recognized, most recently AnnaBelle Events & Rentals received the 2013 Bride’s Choice Award placing the company among the top 5% of wedding professionals nationally. In 2012 AnnaBelle Events & Rentals was named the Best Event Designer in Missouri by the Wedding Industry Experts annual awards. In addition to coordination and design services the company offers their clients an inventory of rentals, providing endless options and the ability to achieve the latest trends and styles. Gus: What local resources were of most useful when launching your company? Anne: Three things come to mind immediately: personal support, a great bank and a great chamber. I’m fortunate to have the ongoing support from my family and fiancé, Wes. They tolerate that I work non-traditional hours and conversations always lead to AnnaBelle Events. In the first few months of starting my business I happened into The Bank of Missouri and could not be more thankful for the financial guidance and continued support I receive from “my bankers”. From applying for an SBA loan to everyday business advice they’ve help me go from being a small business to a well-run company. Last, the Columbia Chamber of Commerce is a life-line to many businesses and where I invest in the growth of fellow business owners and my business community. It is essential for every company to have a network of supporters and mine is within our local chamber. Gus: How important are your relationships with vendors and what are some ways that you successfully cultivate and ensure good rapport? Anne: There are many things that are important to my business and in the top five are those vendor relationships. My clients come to me looking for an expert and someone to create events that are sometimes once in a lifetime, so it must be perfect. I’m in a very creative industry and events take a team of vendors to be executed flawlessly. Having a relationship with those vendors allows us to brainstorm, negotiate and create the very best for our clients. Events also tend to be a bit emotional, so knowing personalities is a must. When referring a vendor their personality is just as important as their price point. The vendors that I have a great relationship know it because we also have a friendship and support each other anyway we can. Through referrals, advice and promoting each other it always goes beyond the actual event. Gus: What advice would you give someone who needs to plan a fundraiser but isn’t sure where to start? Anne: Call me! Is that too direct? My first piece of advice is determine three things before you start planning. Those are budget, the reason for the event and the desired goals/end result. Deciding this in the beginning will guide you through the planning process and get the results you are looking for. It’s important to be realistic and don’t sell the fundraiser short, anything is possible. Make sure the market needs what you’re creating through the fundraiser and be creative about it. We love attending new events and having new experiences. Really, I do encourage them to call me. Not only can we visit about my coordination and design packages but they may just need Event Consulting. Many times there is a board or committee to get the event done but they still need an expert to get them through it. Gus: Why are you so passionate about giving back to your local community? Anne: I think when you grow up somewhere, see a community grow, great people come and go and how they influence their surroundings you can’t help but be passionate. My business is built on relationships that this community has given me and as a business owner it’s my responsibility to give back. If we don’t give back who will? It’s really that simple. It also keeps me in tune with other things happening around me, it’s so easy to get stuck in your bubble and not realize the opportunities around you. Lastly, when the work day comes to an end I want to enjoy the place that I live. Giving back, supporting businesses and being involved let’s me mold Columbia a bit to my liking. Gus: What inspired you to expand the company to offer the market event rentals back in 2011? 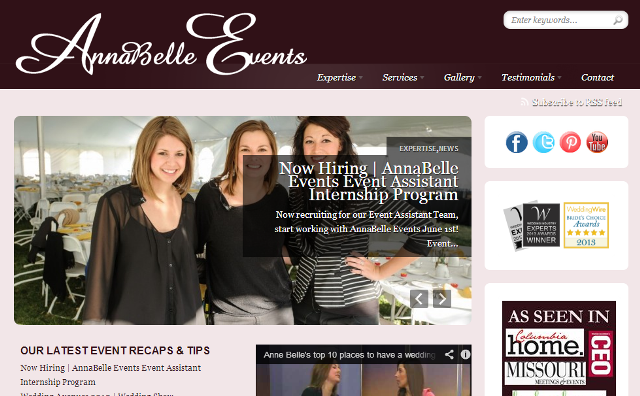 How has this decision changed the direction and vision of AnnaBelle Events & Rentals? Anne: Really it was a matter of quality, convenience and demand. Every item in my inventory is one of two things: something you can’t find in Columbia or something I use at 8 out of 10 events. By expanding the business I am able to provide my clients endless options in rentals because I have relationships with distributors and wholesalers coast to coast. I can also demand a certain level of quality because I own the items or have a vested relationships with the supplier. It truly is a win win for my clients and myself, it hasn’t changed the direction. More it’s expand our abilities and what our clients can envision as a reality for their local events. Gus: What’s the most exciting thing on the horizon for you personally or professionally? Anne: Personally, planning my own wedding! Wes and I plan to get married in April 2014 and I couldn’t be happier to be a Bride myself. Professionally, moving into a new office space! On April 1st I will call Studio 107 on the corner of Orr and Walnut the new home of AnnaBelle Events. I can’t even count on both hands the number of exciting things that this move will bring our company and clients. Stay tuned because there is so much to come! I will celebrate the third year of business for AnnaBelle Events & this October and it’s sure to be as record-breaking as year one and two.